If you have osteoporosis, you've probably been told to find a safe way to exercise in order to help increase your bone density. However, finding the right type of exercise can be a difficult task. Walking and other moderate exercise can help exercise the body, but one of the most beneficial exercises for increasing bone density is yoga. Exercise may seem to be more dangerous than useful for osteoporosis, since it is more likely for an injury to occur during strenuous exercise. However, exercise - when done correctly - actually strengthens the bones and can help improve bone density. This is thought to be because of the interactions between muscles and bones when we exercise. During a workout, the muscles in the body are used more than usual and often stretched and treated to higher resistance. This makes the muscle pull against the bone. While that sounds bad, it actually can help prompt the bone to begin rebuilding and renewing itself, which improves the density in the bone. Full-body exercises are best, because then the bone density benefits are experienced by all the bones in the body. Yoga has been shown in scientific studies to increase bone density, particularly in the spine and the femurs, among people suffering from osteoporosis. Twelve positions in particular were studied, but it is possible that many other types of yoga positions will be able to produce a similar effect. 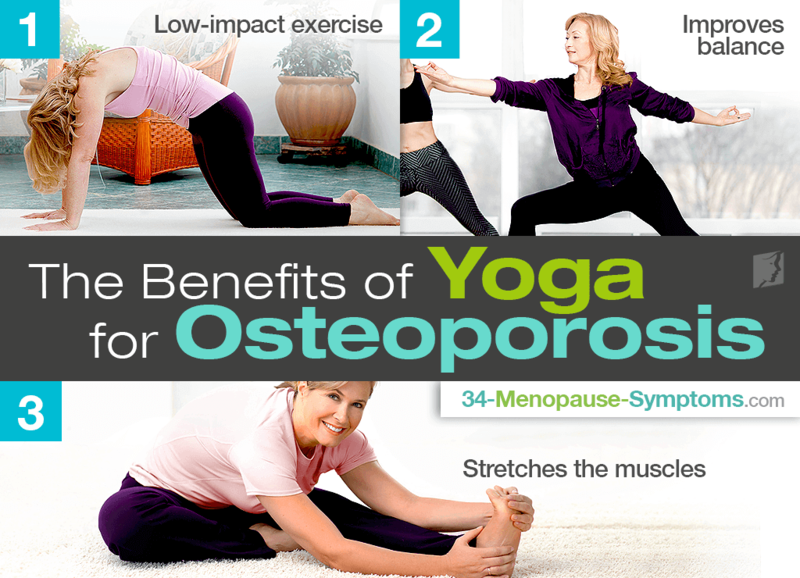 Although no studies have been able to determine exactly why yoga has this effect, there are a number of possible reasons why yoga is the right exercise for somebody suffering from osteoporosis. It provides several benefits that are the most useful for people with low bone density. Yoga is an exercise that does not stress the bones, which is part of why it is such a useful exercise for osteoporosis. Any exercise that is high-impact, like running, can be dangerous for people suffering from osteoporosis. This is because the jarring motions involved in these exercises can cause fractures in the bones of people with low bone density. Yoga is beneficial in helping your body and mind to learn better balance techniques. Falls are the leading cause of fractures in women suffering from osteoporosis, so anything that can reduce the risk of falls is likely to help women reduce their chances of breaking a bone. Muscles need to be worked and stretched in order to pull against the bone and promote bone growth, and yoga is known for stretching. Although it is an exercise that causes a gentler pull on the bone than resistance training, it can still prompt the bones to begin building new growth. With yoga, you can begin to help your bones heal from the damage caused by osteoporosis and can also do your best to avoid any new fractures. To learn more about treating osteoporosis, read about common medications for the disease. Researchers have pointed out that many cultures with diets rich in olive oil have lower rates of osteoporosis. What does this mean for people who have it?